Your 2 Week Sri Lanka Itinerary (or Longer!). Sri Lanka has been getting much attention of late, and for good reason. This previously tumultuous land is now peaceful, welcoming, good-value and most importantly: Home to some of the most stunning landscapes and friendly people. Welcome to bite-sized South Asia – an Island to give you a taste of the dazzling subcontinent. Travelling Sri Lanka: An Introduction. For an island often described as the “teardrop” of India, Sri Lanka punches well above its weight. It would be hard to find another island that offers the range of history, culture, diversity of religion, beaches, tropical rainforests and mountains that Sri Lanka does, not to mention its 8 UNESCO world heritage sights. Sri Lanka is safe, welcoming and beautiful – and it has been seeing an influx of tourists since around 2014. Following 20 bloody years of civil war, peace has been fully restored, even to the north of the country which offers a completely different taste of Sri Lanka (and a chance to get well off the beaten path for those who want to experience a quieter version of Sri Lanka – see our itinerary recommendations below). The history of Sri Lanka is a story in its own right, and today influences of Portugese, Dutch and British bids for power can be seen around Sri Lanka’s port and colonial towns such as Galle, along with relics from the Sinhalese culture dating back to 900AD in the “Cultural Triangle” in the centre of the country. Although Sri Lanka may look small on the map, don’t let that deceive you. There’s a huge amount to see and experience here, and a 2 week Sri Lanka itinerary will give you just enough of a taste to leave you desperate to return. A 3 week Sri Lanka itinerary allows time to take in a few less-visited spots as well. Safaris: Minneriya or Kaudulla National Park? Got Longer than 3 Weeks in Sri Lanka? The weather in Sri Lanka is affected by two different monsoon seasons – meaning that it’s nearly always sunny somewhere in Sri Lanka! For those focusing on the west and south of Sri Lanka, December to March is the best time to visit for dry wether (although surfers bear in mind that the best waves for surfing in the south are May – October), and December to March is generally high season when prices shoot up and visitor numbers soar. May – October is the best time of year for dry weather in the North and East of Sri Lanka, and for surfers. It’s also when you’ll find better deals in most of the country. For those who want to see it all, the shoulder seasons of October – November and April can be a good time to visit. We travelled in November and had dry weather in most places, except in the central cultural triangle area near Sigiriya where it rained for several days. Another misconception of Sri Lanka, is that it will be quick and easy to get around. It may be an island (a pretty big one at that – Sri Lanka is about the same size as Ireland), but roads are narrow and trains run slowly. It takes time to get around Sri Lanka, as well as a little patience. Don’t make the mistake of trying to fit too much in, especially on your first trip to Sri Lanka. Public Transportation is cheap and widely available in Sri Lanka. Trains are the most comfortable option but don’t go everywhere. Lines mainly run in and out of Colombo to different parts of the country. We don’t recommend taking mail trains as these are incredibly slow, and overnight sleeper trains are not necessary either. The Tea Train (that’s the train that runs from Colombo / Kandy to Ella) may have become an instagram sensation, but board any long distance train in Sri Lanka and you’ll be treated to beautiful vistas of beach, jungle and tea country. Fortunately booking and travelling by train is a much more simple affair than it is in neighbouring India – you can try and book tickets in advance (only available in country) or else turn up at the train station an hour or two before the train leaves to buy unreserved tickets. 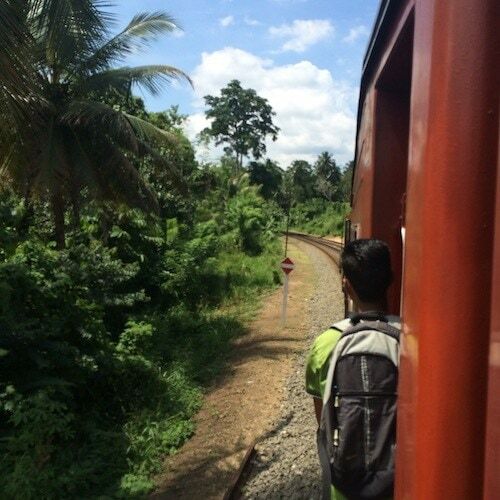 Read our guide to train travel in Sri Lanka & the best journeys here. Buses are not for the faint hearted (mainly because the drivers careen down the middle of the road honking at whatever gets in their way) but are speedy (!) and connect most large towns with each other. They’re also very cheap; you just hop on and pay on board. There’s limited space for luggage (you may end up with it on you for most of the journey) and large bags usually have to go next to the driver. The bus, however is efficient and safe for travellers: our accommodations tried to steer us away from buses and to get private drivers instead – presumably because of the commission in it for them, but we found the bus just fine! Hiring a Car + Driver is one popular way to get around Sri Lanka – especially if you are on a schedule and don’t feel like sitting cheek-to-cheek on sweaty public transport. Costs start from $60 USD per day, it’s best to meet your driver first to see if they are a good fit, or commit to only a day or two at a time to keep your options open. Drivers tend to encourage their passengers to stay and visit where the commissions are better for them – if you do hire a car and driver remember you are the boss and choose where to go, not them! Renting a car in Sri Lanka (without a driver) is possible, but is not recommended unless you have experience of driving in South / South East Asia. Roads are narrow, filled with obstacles ranging from elephants to market stalls, not to mention the carefree bus drivers. If you are planning on hiring a car there are few different rental agencies in Colombo. Officially, you need an International Driving Permit to drive in Sri Lanka. For short distances or getting around town tuk-tuks (or auto rickshaws) are you go to. Just make sure you negotiate a price before hopping in! Sri Lankan transport at its finest. As visitor numbers to Sri Lanka explode, so does the impact of tourism, and overtourism is becoming visible in Sri Lanka. As the tea train to Ella becomes ever more crowded with instagrammers hanging out of doorways, it becomes more and more difficult for locals to get a seat. To create a positive impact during your time here, consider these best practices for responsible travel in Sri Lanka. Spread your spending – avoid all inclusive resorts and eating all your meals / doing all your activities in one place – spread out where you go and who you employ as drivers, guides, etc. Stay in sustainable, eco friendly and locally owned hotels or homestays. There’s an incredible range of eco resorts (some more eco than others – see below), and also homestays to choose from. Avoid chain hotels where you can, unless they are locally owned in favour of more independent options which keep more of your tourist dollars in local hands. Dress Modestly. Sri Lanka has seen an influx of tourism and with it plenty of skimpy swimwear, but Sri Lanka remains a culturally modest place. Bikinis are fine for touristy beaches, but as soon as you’re off the beach, cover up – especially if passing through local villages. In general for women, shorts are OK in touristy areas, but it’s better if you can cover your legs to the knees and wear tops to your shoulders / upper arms. For local beaches consider swimming in a t-shirt & shorts to avoid a crowd of local onlookers. Cleavage is a no-go. Light, cool, loose fitting clothing will help you keep cool and avoid sunburn too. Guys, just don’t walk around with your tops off. Respect the Ellies 😉 (and other wildlife). As tourism to Sri Lanka has increased, so have opportunities to get up close and personal with the country’s most famous mammal: the Elephant. Unfortunately places posing as “sanctuaries” or “orphanages” are usually catering to tourists who want photos rather than to the animals. Please stay clear of any interactive experiences with elephants (riding, bathing, selfie-posing etc) and opt to watch them in their natural habitat from a jeep at a respectful distance (such as the ones offered at Kaudulla, see below). Got more time on your hands? Great! Checkout our 3 week Sri Lanka itinerary below, as our 2 week Sri Lanka itinerary is sure to leave you wanting more of Sri Lanka! Arrive in Colombo’s capital and take time to get your bearings in this rapidly developing city by the ocean. There’s plenty of colonial architecture to explore, or wander the markets around Fort station on foot. The food and shopping at Barefoot (there’s a store inside the Old Dutch Hospital as well as the one on Galle Road) is not to be missed. Make a stop off at Colombo Fort railway station to buy your tickets to Habarana (Day 3). Come evening head to Galle Face to watch the sunset as kids fly their kites and families gather to eat snacks from street food vendors. For a treat, head to the Galle Face Hotel for a cocktail with a view! On Day 2 take in more of the city or alternatively take a day trip to Negombo, a fishing village to the North of Colombo. It’s beach is popular due to it being only 8km’s from Colombo’s international airport, but the way of life here is definitely slower paced than in the capital. Relax on the beach or take a tour of the fishing lagoon for a few hours. The easiest way to travel from Colombo to Negombo is by train, there are two options: Either take a direct train from Colombo to Negombo (which takes 1.5 hours each way), or take a train from Colombo to Katunayake South Train Station (1 hour) and take a 10 minute taxi ride to Negombo from there. You can find train times here. On Day 3 it’s an early morning start to take the train to central Sri Lanka and the jumping off point for safari country: Habarana. Sustainable Choice: Colombo Court Hotel. This beautiful carbon neutral hotel uses solar energy, rainwater collection systems, recycled materials and eco-friendly decor. Check rates and availability at Colombo Court Hotel here! Wow Factor: Jetwing Seven Hotel. For a rooftop infinity pool with incredible views, Sri Lankan group Jetwing’s Colombo hotel is the place to be! Enjoy guilt free as the Jetwing group are committed to sustainability, too. Check rates and availability at Jetwing Seven Hotel here! Colombo on a Budget: Gower House. This charming bed and breakfast is located in Colombo 5, in the southern part of the city, in a heritage style home. Check rates and availability at Gower House here! Arrive in Habarana on the afternoon of Day 3 and make your way to your accommodation. For Minneriya and Kaudulla you can base yourself pretty much anywhere within the Cultural Triangle region (see below). As you’ll have a few days here, you can switch it up and try different accommodations, or base yourself in one place for all nights and enjoy leaving your bags unpacked! Minneriya is the largest national park in the area and is famous for its annual “gathering” – that is where hundreds of elephants and other wildlife migrate to the waterholes of the park during the region’s dry season that runs from June/July to September each year. Because of this phenomenon, visitors have flocked to Minneriya. We visited Kaudulla for our jeep safari seeing as we were visiting in October – outside of the time of the “gathering”, and had a wonderful experience. Initially it was rainy and we drove for a few hours without seeing a single elephant. Eventually, we came upon a young male hiding underneath a tree, trying to stay dry! Then, as sunset began to approach, the skies cleared, the sun came out, and as we headed down to the lake we came across 20-40 elephants enjoying the sun and drinking away. The gathering actually takes place across Kaudulla and Minneriya national parks, which are in fact right next to each other and only separated by a thin elephant corridor (jungle). Our advice is to ask for local tips on which park is best to visit at the time you are there, and which is less crowded – our sources tell us that Kaudulla still has the edge in terms of being less popular. Beyond seeing elephants, the parks are home to beautiful birdlife, monkeys, sambar deer, wild boars, and even the occasional leopard and sloth bear. Sustainable Choice: Kuwera Eco Lodge was constructed using only local materials, by local workers, and offers the chance to stay in what feels like a traditional Sri Lankan village (with a few extra creature comforts!). Located near Sigiriya, they also offer yoga retreats and classes. Check rates and availability for Kuwera Eco Lodge here! Wow Factor: Kalundewa Retreat. If you have the opportunity to treat yourself to some truly amazing accommodation, you might just want to do it in Sri Lanka’s cultural triangle. Luxury resorts abound and standalone villas on stilts with uninterrupted views out onto the grasslands come with some serious wow factor – few more so than Kalundewa retreat, that does it’s luxury sustainably too. With just six villas, you’re sure to get the VIP treatment, too. Check availability and rates for Kalundewa Retreat here! Cultural Triangle on a Budget: The Green Edge. Simple but beautifully done Bed and Breakfast at the Green Edge is located in Dambulla and boasts its own walled garden, with lots of water features around the property to inspire inner zen. Check availability and rates for the Green Edge here! A couple of days here should be enough to explore Sigiriya – the Lion’s rock – as well as the caves at Dambulla and a trip to Polonnaruwa. These attractions are all in the same area between Habarana to the North and Dambulla to the South – so you can combine these days with your Kaudulla / Minneriya safari above. Sigiriya is an ancient rock fortress that is almost 200m high, towering over the plains and grasslands of the surrounding area. Listed as a UNESCO world heritage site, the area is rumoured to have been occupied by monks since prehistoric times. There are fantastic views from the top of Sigiriya rock, but it’s quite a climb up to reach it! We recommend going early in the morning while the sun is still (relatively) cool. There are some beautiful caves with paintings inside on the way up. Polonnaruwa was the second royal capital of Sri Lanka and was built after Anuradhapura was destroyed in 993. Nowadays it is an archaeological park filled with hundreds of ancient treasures, including statues, stupa, tombs and temples, and has been declared a UNESCO World Heritage Site. Most of the archaeological remains visible today date from the 12th century. One of the highlights of Polonnaruwa is the Sacred Quadrangle, sometimes also called the Royal Citadel, which consists of a compact group of buildings surrounded by a wall. Besides the Quadrangle, another area that’s definitely worth visiting is Gal Vihara, or the Rock Temple. Here, you’ll find three giant 12th-century Buddha statues carved out of a granite boulder. Each one is in a different pose — a standing Buddha, a reclining Buddha, and a seated Buddha. The reclining Buddha is the largest of the three, stretching out 46 feet (14 meters). The ruins of Polonnaruwa are spread out over a wide area in different groupings, so it’s a good idea to rent a bicycle so you can explore the whole complex. You’ll find plenty of homestays and other places around town that rent bicycles for the day. While there are a couple of kiosks inside the archaeological park selling fruit and snacks, it’s a good idea to ask your homestay or a local restaurant to prepare you a packed lunch of yummy Sri Lankan food. Just “down the road” from Sigiriya, the caves at Dambulla are worth a look-around if you’ve not had your fill of carvings and culture. The Dambulla Cave temple is another UNESCO world heritage site and is the largest and best-preserved cave temple complex in Sri Lanka. A couple of hours here also provides some respite from the midday sun as you explore the caves which have been well looked after. Hop on a bus from Dambulla to Kandy (around 2 hours). Kandy is Sri Lanka’s second city and is centred around its lake. Surrounded by mountains and tea country to the east, Kandy is home to important buddhist sites such as the Temple of the Sacred Tooth which is the number one visitor attraction. It’s also home to some tasty eating options for after your evening lake-side stroll! Built in the 16th century, the Temple of the Sacred Tooth is best visited early in the morning before some of the crowds pour in – it’s a beautiful temple to wander for a couple of hours although please be warned that you won’t actually be able to see the Budha’s tooth (that’s for dignitaries only it seems 😉 ). For a view of Kandy from up above, climb the big buddha statue in the late afternoon for panoramic views of the city. If you’re in need of some tranquility, you could pay a visit to Kandy’s botanical gardens which are filled with exotic flowers, although at 15$ per person entry, it’s a bit of a pricey excursion. Sustainable Choice: Madulkelle Tea & Eco Lodge Set a little away from Kandy itself, the Madulkelle Tea and Eco Lodge is a retreat in the Knuckles mountains that surround Kandy. Luxury clamping style bedded tents on wooden platforms have balconies that open up to panoramic views, there’s an infinity pool, and the resort also runs various community initiatives to provide welfare for its tea-pickers, workers and the local community so that they can benefit from tourism, too. Check rates and availability here! WOW Factor: Serene Kandy Located in Kandy town centre, just a few minutes from the lake, Serene Kandy has beautiful, modern rooms, views of the lake and a wow-factor rooftop pool! Check rates and availability here! Kandy on a Budget: Stay Kandy We stayed at StayKandy, a simple bed and breakfast which has a very welcoming and helpful family! Backpackers and travellers have been coming here for decades. Rooms are simple but clean and some have balconies too. Set a few minutes walk from the lake. Check rates and availability here! Get up early this morning to catch the train from Kandy to Ella – aka the “Tea Train”. It’s worth going to Kandy Railway station the day before to see if you can pick up any tickets for reserved second class. You’ll want to take the earliest train to Ella (which leaves Kandy at 8.40am). As this route gets more and more popular, be prepared for crowds on this route. As the undisputed tourism capital of the Sri Lankan highlands, Ella has a lot to offer. First of all, simply getting to Ella forms one of Sri Lanka’s most memorable experiences. The Kandy to Ella Railway winds slowly through rolling hills of terraced tea plantations and small villages where you’re certain to attract a wave or two from the locals. While in Ella, a visit to a Tea Plantation / Factory is a must. Taking a tour of a tea plantation adds not only to your knowledge of what makes a good brew but gives a deep insight into the colonial history of Sri Lanka. Newburgh Green Teas on Ella-Passara Road offers tours almost on request of their small working factory. Hiking to Ella Rock is a must-do adventure activity and helps to build a healthy appetite. This hike follows a mostly unmarked trail and has travellers navigating railway lines, tea plantations and some steep trails in order to get sweeping views of a multi-layered valley. Guides can be found easily or instead, like most, get a ‘back-of-the-napkin map’ from a local in the know! Ella has an abundance of accommodation running downhill from the train station. Sustainable Choice: Ella Eco Lodge is managed by local conservationist Sampath Perrera, who was inspired to create Ella Eco Lodge to challenge what he saw happening in other areas of Ella – nature being rapidly destroyed by concrete hotels and guesthouses as tourism has grown. Ella Eco Lodge is built entirely from wood, and rooms have beautiful balconies to watch the forests and mountains from. Check availability and rates here! Wow Factor: Koslanda Heritage Eco Luxury hotel, Koslanda, is surrounded by the magical forests on its own estate in the heart of hill country. Villas have their own private courtyard and long veranda and there are three ambalamas (pavilions), ideal for settling down with a good book and a cool drink. The resort is involved in reforestation initiatives as well as providing opportunities for the local community and ensuring the sustainability of the resort. Check availability and rates here! Ella on Budget: Tomorrowland. To get off the beaten track and away from the traditional home-stays, consider venturing further afield to Tomorrowland. This hostel come campground has stylish hammock tents strung up over the tea plantations and along with amazing views has a bohemian vibe catering well for budget travellers. Check availability and rates in Ella here! After some fresh mountain air, it’s time to head south! There is no railway heading south from Ella, so you’ll need to take the bus or else arrange a transfer / taxi. Where to go on the South Coast? The south of Sri Lanka has seen rapid development over recent years as hotel chains have rushed to grab a slice of the Sri Lanka tourism boom pie. If you visit outside of high season (Dec – Mar) you should benefit from fewer crowds and better room availability / prices. The most popular beaches in southern Sri Lanka are Unawatuna, Mirissa and Tangalle, however they are also some of the country’s most crowded. Unawatuna has the benefit of being closer to Galle, whereas Mirissa offers some of Asia’s best whale watching (Raja and the Whales offer responsible whale watching trips). We fell in love with the small beaches in between Unawatuna and Matara which you could spend days exploring. For those looking to learn to surf in Sri lanka we loved the beach break in Welligama bay and highly recommend surf camp Soul & Surf who offer high-end surf camps and surfing lessons at international standards. Search for Sri Lanka surf camps here. Here are some of our favourite accommodation options along various parts of Sri Lanka’s southern coast. Sustainable Choice: Kaju Green eco lodges is an exclusive eco retreat adjacent to a Sri Lankan bird and wildlife sanctuary. Set in the grounds of a former coconut and cashew nut plantation, the property is surrounded by small canals and rivers from the lake, this is a truly peaceful spot. Yoga and ayurveda treatments / sessions are on offer. Check rates and availability here! WOW Factor: Tri Hotel For next level relaxation, look no further than TRI hotel in Koggala. Just inland from Ahangama (near where we learned to surf) and set amongst the wetlands is TRI hotel, a sustainable, serene hotel in Sri Lanka, where three-quarters of the property is surrounded by Lake Koggala. Check rates and availability here. South Coast on a Budget: Maison D’hotes Sanda Beach (Mirissa) is simple and gets good reviews, and there are plenty of budget options in Unawatuna. Click here to browse Unawatuna hotels. Hop on the train or take a bus along the scenic coastal route towards Galle, a historic trading port during colonial times with a pretty, walled city. The old walled city of Galle is perfect to walk around and spend time browsing the artisan focused (if a little pricey) shops, sip tea in cafes, and admire the views out to sea from the town walls and lighthouse. The Old Town has special protected status as a UNESCO world heritage site. The old town can get a little busy during high season, so if you are staying nearby, head out to explore early morning before the day-trippers arrive. For those interested in history, Galle is home to the National Maritime museum of Sri Lanka, which unfortunately lost many of its exhibits during the 2004 boxing day Tsunami which badly affected this part of Sri Lanka, but the museum is still worth a look and grateful for the support of visitors. The city is home to many Dutch colonial buildings which you can explore, including the Old Dutch Market. The old town is full of boutique hotels and smaller bed and breakfasts / homestays, and you’ll find some larger resorts with more space outside of the town centre. Expect to pay a bit of a premium for staying inside the city walls. Sustainable Choice: Atapattu Walawwa. Our friend Brianne of A Traveling Life stayed at Atapattu Walawwa, half a mile away from the fort.Built in 1742 by Mudaliyar Don Bastian Gooneratne, it has remained in his family to this day, and many scholars, educators, doctors, and other prominent officials have called it home along the way. A protected monument, the house is an architectural feat, having remained mostly unchanged over the past 300 years – even original wood and tile remain. The building was intentionally designed to maximize the environment for protection against the natural elements – it is cooled by the southeast winds from the Indian Ocean that whip through the central hallway and courtyard, and it never receives the sun’s direct glare. During the 2004 tsunami, the dense palm trees and foliage surrounding the house provided a natural barrier, so fortunately, damage to the property was minimal. Traditional processes for dealing with rainwater and groundwater as well as termites are still used as well. Inside the house you’ll spot many Buddhist motifs like lotus flowers used as decorations throughout. Check availability and rates for Atapattu Walawwa here! WOW Factor: Fort Bazaar hotel. Once a Merchant home from the 16th century, the stunning Fort Bazaar hotel is a boutique hotel located in the heart of the Galle Fort. Built around a traditional Galle Fort private courtyard boasting the acclaimed Church Street Social restaurant library and Z Spa. Expect stylish decor, neutral tones with high end finishes, fine dining and contemporary four poster beds in the heart of Galle Old town. Check availability and rates here! Galle on a Budget: There are plenty of homestays, bed and breakfasts and hostels in or nearby Galle – check out reviews and prices by searching here. Colombo Bandaranaike International Airport is on the North side of Colombo (near Negombo) so if driving from Galle, you’ll need to allow 3 hours travel time. By public transport there is a direct airport bus (ask around for details) which takes around 3-4 hours. If you prefer to travel by train you’ll need to take the train to Colombo and then transfer to the airport bus at Colombo Fort station. Roads can get busy at weekends so plan ahead and allow extra time! If you have more than two weeks in Sri Lanka, great! This is where the fun begins and you can get off the beaten path a bit, too. These are some recommendations for a 3 week Sri Lanka itinerary – you can go with the above one and simply stay longer in some spots, or add on an extension to Yala National Park on the South Coast, too! On day 4 of the 2 week Sri Lanka itinerary, instead of taking the train to Habarana, take the train North to Jaffna. When leaving Jaffna, take the train south to Anuradhapura, where you can visit this ancient Sri Lankan Capital, before rejoining the itinerary above for the Cultural Triangle section at Sigiriya / Habarana by bus from Anuradhapura. Jaffna is culturally very different than much of the rest of Sri Lanka, historically this was/is the Tamil region of Sri Lanka and is where the ‘Tamil Tigers’ held out for longest during the Sri Lankan civil war. It has remained off the tourist map until the last couple of years, and is still a relatively off the beaten track alternative to the sometimes busy south of Sri Lanka. Even Sri Lankans are reluctant to travel up here despite the region being perfectly safe, but we highly recommend a visit here. This region of Sri Lanka culturally has more in common with India and Hindu temples, dosas and ‘Pure Veg’ restaurants abound. There are also a number of Catholic churches that you can visit too. Take a day for leisurely exploring Jaffna’s markets and temples and chatting with locals. You can also visit nearby islands off Jaffna by boat, there are a number of them that are close by and can be easily accessed. You can search for places to stay in Jaffna here. Instead of heading south from Ella (Day 10 above), head west from Ella to Nuwara Eliya to explore Sri Lanka’s tea gardens further. From here you can visit the Horton Plains and even climb Adam’s Peak, Sri Lanka’s highest mountain. When you’re all outdoors-ed out, you can head south for some well deserved R&R on Sri Lanka’s beaches and pick up the 2 week itinerary. These tips are from our friend Cazzy at Dream Big, Travel Far. Nuwara eliya is known as the “Little England” of Sri Lanka thanks to it’s cooler climate, rain and amazing tea plantations! Nuwara Eliya is easily one of my favourite spots in all of Sri Lanka. To get here you can take the famous scenic train ride from Kandy, or rent your own tuk-tuk and travel through the tea fields and countryside at your own pace. When it comes to things to do in Nuwara Eliya, you’re truly spoilt for choice. Nature enthaustics will love the hiking opportunities in Horton’s National Park or Moon Plains, or visiting one of the many brilliant waterfalls in the vicinity, including Lovers Leap and Devon Falls. If you’re looking for a more relaxing activity, then stop by Gregory Lake and enjoy a boat ride. Or, when the season is right, head to the strawberry fields to pick your very own delicious strawberries. If you love flowers, then visit the Victoria Park with it’s beautiful flowers and fountains, it’s the perfect spot for a picnic. Also, you can’t leave Nuwara Eliya without visiting one of the brilliant tea factories for good cuppa. My favourite was Tea Castle, because you had tea in a building that was shaped like, you guessed it, a castle! Plus, it has awesome views of the waterfalls. You can easily spend 3-4 days in Nuwara Eliya just reconnecting with nature and welcoming the cooler air. It’s a gorgeous part of Sri Lanka and shouldn’t be left out of your itinerary. These tips are from our friends Laura & Matt at Two Stay Wild. Adams Peak is a deeply religious and celebrated pilgrimage site with a striking conical summit located on the southern side of central hill country in Sri Lanka. The summit itself is the site of the “sacred footprint” (a footprint shaped indentation in the rock at the top), believed predominately to be that of Lord Buddha, however it is also believed to be that of Adam when first stepping foot on earth after he was exiled from the garden of Eden and Hindus believe it to be the footprint of Shiva. We took on the challenge to hike to the top at the end of November 2018, just before pilgrimage season starts. We stayed in Hatton, approximately 30 minutes drive from the start of the trail, which can be easily accessed by bus/train from most major destinations in Sri Lanka. Accommodation in Hatton is plentiful and we opted for a simple homestay on the outskirts of town with views across the tea plantations. All guesthouses can arrange transport to the start of the trail at an additional cost. It’s an early start if you want to reach the summit before sunrise and we arranged to arrive at the start of the trail for around 02:30, allowing us a good 3 hours to ascend. The trail was surprisingly busy for being out of season, mostly consisting of excited tourists rather than local pilgrims. The ascent took a lot less time than we were expecting, and we reached the top in under two hours. If you are of reasonable fitness, you should find the hike easily achievable with a bit of effort. The summit was a hive of excitement as hikers arrived and set up camp waiting for the morning’s sunrise to break. Make sure to pack plenty of layers including a hat, as it’s pretty chilly up there. A spare t-shirt to switch into is also a good idea, as you’ll get pretty sweaty on the mission up. As the sun starts to break the sky turns all kinds of multicoloured blues and purples and if you head over to far side of the summit, you might even get a glimpse of Adams Peaks famous conical shape shadowed on the clouds. It definitely makes the early start worth it. Lucky you!! Sri Lanka has still more to offer – including the East Coast which is home to some beautiful beaches and surfing spots, to the incredible eco resort of Gal Oya near Yala National Park – you will find more than enough to keep you busy in Sri Lanka for over a month. Let us know your favourite places to visit in Sri Lanka and what else you would add to these itineraries in the comments below!